As mentioned previously, we do specialise in Transport covers, mainly land transport, but some aviation issues have been produced with some very interesting and unusual varieties. Some of these will be seen in our Limited Offers pages from time to time, so it is worth keeping a check on this site. Most of the covers have been Tram and Rail orientated although some bus issues have also been produced. The Transport series is a mixture of Transport events and First Day Covers where a Transport link has been achieved. The First Transport Series which is still going but at a slow rate, is produced on the longer DL size covers, where as the recently started and now almost sold out "2nd" Series is produced on the handcrafted covers with only 50 being produced per issue so far. Some illustrations of the first series can be seen on page 7. This series which started in 2004 is produced on handcrafted covers and so far 50 covers have been produced for each issue. It is virtually sold out but new covers will be added to the set from time to time. 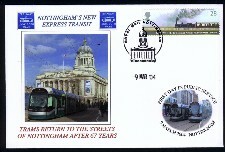 The Nottingham Tram cover issued for the first day of public service is illustrated. Sometimes specially commissioned handstamps will be used but on other occasions a philatelic handstamp will be used. This cover was issued to commemorate the Royal Opening by HM the Queen of the countries first new style Tram system. Running between Altrincham and Bury right through the heart and city streets of Manchester it heralded a change in public transport in a number of different parts of the UK. 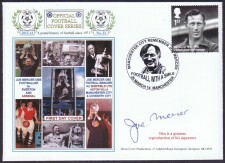 A special Royal Mail handstamp was sponsored for the event and an informative filler card is included with each cover. These covers are available at £5 each (single stamp). 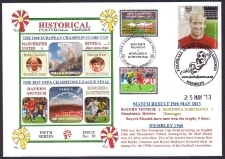 Other versions are available on request including a small number with full sets of stamps on First Day of Issue of the GREEN ISSUE - very topical these days. This cover was issued in conjunction with "The Met Office" and shows how weather is so important to Transport. Four different superb paintings by Stuart Avery show the effect of the weather on the D-Day landings, Snow at Dent Railway Station in 1947, Fog affecting Bus travel in the big London Smog in 1952 and finally glorious sunshine and the Blackpool "Boat" Trams. On the right hand side of the cover is a weather satellite picture which is decoded into a weather map as shown in the special handstamp. The stamp issue marked 150 years of Weather Charts and as a special extra, a reproduced copy of the first ever weather chart will be enclosed with each cover. Individual charts can be supplied (unfolded at £3 each) ideal for framing, but the one suppled with the cover will be folded in half, for simpicity in posting. Price for cover with one stamp and containing an informative filler card jointly compiled by Michael Fish plus a weather chart £6. A few covers with a full set of stamps on are £10 each (inclusive of a weather chart). Some are also available personally signed by TV Weatherman Michael Fish - details on request.